This article is about the baseball player. For the Scottish footballer, see Russell Martin (footballer). For the radio host, see Russ Martin. Russell Nathan Coltrane Jeanson Martin, Jr. (born February 15, 1983) is a Canadian professional baseball catcher for the Toronto Blue Jays of Major League Baseball (MLB). He has previously played for the Los Angeles Dodgers, New York Yankees and Pittsburgh Pirates, and is a four-time MLB All-Star. In 2007, Martin won the Gold Glove Award and Silver Slugger Award. Martin became the everyday catcher for the Los Angeles Dodgers immediately upon his MLB debut in 2006, and continued in that role for nearly five years. His offensive and defensive performance earned wide accolades during his first three years, but they diminished significantly in 2009 and 2010; Martin spent the last two months of 2010 on the disabled list. After the Dodgers declined to offer him arbitration in 2011, he signed with the Yankees and succeeded Jorge Posada as the Yankees' everyday catcher. In November 2012, Martin signed a two-year free agent contract with the Pirates and took over the team's everyday catcher duties. Following the 2014 season, he signed a five-year, $82 million contract with his hometown Blue Jays. Martin was selected in the 35th round of the 2000 Major League Baseball draft by the Montreal Expos, but did not sign. He then attended Chipola College for two years where he met future teammate José Bautista, before being chosen in the 17th round of the 2002 Major League Baseball draft by the Los Angeles Dodgers. Drafted as a third baseman, Martin played his first professional season with the Gulf Coast Dodgers, and hit .286 with 10 RBI in 41 games. In the offseason, he was converted to a catcher. Martin played the 2003 minor league season with the Ogden Raptors, and was later promoted to the Class-A South Georgia Waves. In 77 combined games, he batted .276 with 9 home runs and 50 RBI. Martin was a Florida State League All-Star catcher while with the Vero Beach Dodgers in 2004, playing 122 games and batting .250 with 15 home runs and 64 RBI. During the offseason, Martin played with the Scottsdale Scorpions of the Arizona Fall League. In 2005 he played in a career-high 129 games for the Double-A Jacksonville Suns and made the All-Star team, hitting .311 with 9 home runs and 61 RBI. Martin began the 2006 season with the Triple-A Las Vegas 51s, where he hit .297 in 23 games before his promotion. Martin was promoted to the Dodgers on May 5, 2006, after a wrist injury to starting catcher Dioner Navarro. He got two hits, including a double, in the game. His first hit was against Chris Capuano. On May 7, he hit his first major league home run against Milwaukee Brewers pitcher Dave Bush. On June 6, 2006, Martin and Éric Gagné made baseball history by becoming the first French Canadian battery in the majors. Martin's play was good enough that, on June 26, 2006, Navarro was traded to the Tampa Bay Devil Rays. On August 13, 2006, Martin hit his first career walk-off home run in a victory that completed a sweep of the rival San Francisco Giants. On September 18, 2006, Martin hit a solo home run off of Trevor Hoffman, the third of four consecutive home runs in the bottom of the 9th inning to tie the San Diego Padres. It was the first time four home runs had been hit in a row since the 1964 Minnesota Twins. On April 21, 2007, Martin hit a walk-off grand slam against Pittsburgh Pirates pitcher Shawn Chacón in the bottom of the 10th inning. This was the first grand slam of his career. In May 2007, Martin broke the Dodgers' franchise record for single-season steals by a catcher (12) set by John Roseboro in 1962. On July 1 it was announced that Martin finished in first place in All-Star Game voting, leading Paul Lo Duca by 296,948 votes. He became the first ever Canadian born catcher to start the All-Star Game. At the end of the 2007 season, he was awarded with the National League Gold Glove Award and the Silver Slugger Award. On May 2, 2008, Martin started his first game at third base since reaching the Majors, allowing veteran backup Gary Bennett to spell Martin behind the plate. Martin made his second all-star game during the 2008 season. He caught 10 innings of a 15 inning game in which the American League won 4 to 3. Martin's 10 innings caught are tied for fourth place all time among all star catchers in a single game. On January 20, 2009, Martin signed a one-year, $3.9 million contract to avoid salary arbitration. The deal was the largest ever awarded to a catcher in his first year of arbitration. He played for the Canadian team during the 2009 World Baseball Classic and then rejoined the Dodgers. He slumped offensively in 2009, hitting only .250 with 7 home runs in 143 games, the weakest totals in his four-year career. In 2010, Martin continued to regress as he hit .248 with 5 home runs and 26 RBI in 97 games. In August, Martin suffered a torn labrum in his right hip when he was trying to avoid a tag at home plate in a game against the Padres. The injury kept him sidelined for the rest of the season. Due to his uncertain recovery from injury and declining production, and concern that Martin would be awarded a salary as high as $6 million in arbitration, the Dodgers did not tender Martin a contract for 2011 and allowed him to become a free agent. The Dodgers offered Martin a one-year contract worth $4.2 million prior to the arbitration hearings but he insisted on receiving well above $5 million. After Martin rebuffed the Dodgers' offer, the Dodgers non-tendered him and signed journeyman catcher Rod Barajas, though hinting that Martin could still have a place on the team. Martin said the Dodgers had shown by avoiding arbitration that they no longer "believed in" him. Martin agreed to a $6 million guaranteed one-year contract with the New York Yankees for the 2011 season. The value of the contract could reach $9.4 million if he caught 110 games. Martin began the 2011 season as the everyday catcher for the Yankees. He was elected to the 2011 American League All-Star team as a Yankee. Along with Robinson Canó and Curtis Granderson, Martin was one of the Yankees' three batters who hit an MLB record three grand slams in a single game in a 22–9 rout of the Oakland Athletics at Yankee Stadium on August 25, 2011. As a Super Two player, Martin was eligible for arbitration for a fourth time, and he signed a $7.5 million one-year contract with up to $100,000 in performance bonuses with the Yankees to avoid arbitration on January 24. He spent the year as the starting catcher with Chris Stewart as his backup. In 133 games, he hit .211 with 21 HR and 53 RBI. Martin started all 9 games of the Yankees postseason, going 5-31 with 1 HR. On November 29, 2012, Ken Rosenthal reported that the Pittsburgh Pirates had signed Martin for two years and $17 million. The deal became official on November 30. On June 4, 2013, Martin made his first start and appearance at right field. On June 8, 2013, Martin hit his 100th career home run. In the NL Wild Card Game on October 1, 2013, Martin hit a pair of solo home runs as the Pirates defeated the Cincinnati Reds 6-2. The first was an infamous home run off Reds starter Johnny Cueto. Cueto, having his name chanted by 40,000 Pirates fans, dropped the ball while on the mound. His next pitch, a fastball over the heart of the plate, was crushed into the left-field stands by Martin. This home run gave the Pirates the momentum to win the game, their first postseason victory in 21 years. During a game against the Milwaukee Brewers on April 20, 2014, Martin was involved in a brawl that was started after Carlos Gómez hit a triple off of Gerrit Cole. Martin was suspended 2 games by the MLB on April 22, 2014 for his role in the brawl. On November 18, 2014, the Toronto Blue Jays announced that they had signed Martin to a five-year, $82 million contract. Early in spring training, manager John Gibbons told reporters that Martin would be R. A. Dickey's catcher during practice and in preseason games, to give him the opportunity to practice catching Dickey's knuckleball. Martin received a standing ovation from the fans at Olympic Stadium on April 3, as the Blue Jays played their final two spring training games in Montreal for the second consecutive year. On April 19, Martin caught Jeff Francis in his debut for the Blue Jays, and in doing so formed the first all-Canadian battery in franchise history. On June 2, Martin stole home off the back end of a double steal, and in doing so became the first Blue Jays player to steal home since Brett Lawrie did so in 2012. Martin established a new career-high in home runs on September 26, hitting his 22nd of the season to aid the Blue Jays to a 10–8 win over the Tampa Bay Rays. He ended the 2015 regular season with a .240 batting average, 23 home runs, and 77 RBI in 129 games. On October 29, Martin was announced as a finalist for the catcher Gold Glove award, along with Salvador Pérez and Jason Castro. Martin was first selected to play for Canada during the 2009 World Baseball Classic. That year, in an effort to quit the use of chewing tobacco, Martin began wearing a custom-fitted mouthpiece during the WBC and Spring training. Martin hoped to switch to shortstop during the 2013 World Baseball Classic, citing he did not want to learn another pitching staff during the tournament, because he was already learning a new staff in Pittsburgh. Martin played third base in the minors before converting to catcher. Martin would later withdraw his name, citing soreness. Martin was born in Toronto, Ontario, and spent his early childhood in Montreal, Quebec. He is biracial: his father, Russell Martin Sr., is black, while his mother, Suzanne Jeanson, is white. They separated when Martin was two years old. His full name is Russell Nathan Coltrane Jeanson Martin, Jr. Russell is taken from his father, Nathan from his great-grandfather, Jeanson from his mother, and Coltrane to pay homage to John Coltrane. His father used to play saxophone in Montreal metro stations to help pay for his baseball training. When Martin was eight years old, his mother remarried, and he relocated with his mother and sister to Paris, France. On April 3, 2015 at the spring training game of the Toronto Blue Jays hosting the Cincinnati Reds at Montreal Olympic Stadium, Russell Martin Sr. played the Canadian National Anthem on his saxophone. Along with playing baseball in the Montreal neighbourhood of Notre-Dame-de-Grâce, Martin played hockey for N.D.G. Minor Hockey. He graduated from Polyvalente Édouard-Montpetit High School. After graduating from high school, Martin took a junior college scholarship at Chipola College in Marianna, Florida. Martin changed the name printed on his jersey to "J. Martin" for the 2009 season in reference to one of his middle names "Jeanson", in honour of his mother. ↑ "Pirates reel in quite the catch with Martin". MLB.com. November 30, 2012. Retrieved October 7, 2013. 1 2 Chisholm, Gregor (November 18, 2014). "Blue Jays land free-agent catcher Martin". mlb.com. Retrieved November 18, 2014. ↑ "35th Round of the 2000 MLB June Amateur Draft". Baseball-Reference.com. Retrieved May 27, 2015. 1 2 3 4 5 Kelly, Cathal (June 9, 2007). "Catching the fast train to L.A. – Montreal resident Martin solid behind plate for Dodgers". The Star. Retrieved April 16, 2008. 1 2 3 4 5 6 "Russell Martin Minor League Statistics & History". Baseball-Reference.com. Retrieved May 27, 2015. 1 2 3 4 "Russell Martin achieves stardom in second big-league season". Sporting News. June 14, 2007. Retrieved April 18, 2008. 1 2 "Russell Martin Bio". MLB.com. Retrieved May 27, 2015. ↑ "Mets vs. Dodgers — Box Score — June 6, 2006". ESPN. June 6, 2006. Retrieved April 18, 2008. ↑ "ESPN — Dioner Navarro Stats, News, Photos, – Tampa Bay Rays". ESPN. Retrieved April 18, 2008. ↑ "Giants vs. Dodgers — Box Score — August 13, 2006". ESPN. August 13, 2006. Retrieved April 18, 2008. ↑ "Padres vs. Dodgers — Recap — September 18, 2006". ESPN. September 18, 2006. Retrieved April 16, 2008. ↑ GoBlue1324 (December 27, 2007). "2008 Fantasy Baseball: Catchers". Sporting News. Retrieved April 18, 2008. ↑ Spencer, Lyle (July 11, 2007). "Dodgers take All-Star Game by storm". MLB.com. Retrieved April 18, 2008. ↑ "The Official Site of Major League Baseball: History: MLB Awards". MLB.com. Retrieved April 18, 2008. ↑ "Maddux wins record 17th Gold Glove". Sporting News. November 6, 2007. Retrieved April 18, 2008. ↑ "The Official Site of The Los Angeles Dodgers: News: Martin starts at hot corner". MLB.com. May 2, 2008. Retrieved September 2, 2008. ↑ Gurnick, Ken (July 6, 2008). "Martin gets second straight All-Star nod". MLB. Retrieved September 12, 2011. ↑ Hoch, Bryan (July 16, 2008). "Night is Young: AL walks off in 15th". MLB.com. Retrieved September 2, 2008. ↑ Source: Dodgers give Martin 1-year, $3.9M deal. Retrieved on January 20, 2009. ↑ "Dodgers elect to non-tender Russell Martin; reach deal with Rod Barajas". Latimesblogs.latimes.com. December 2, 2010. Retrieved September 15, 2011. 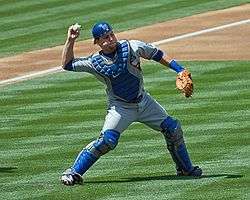 ↑ "Russell Martin's sad fade to black as a Dodger: catcher reportedly signs with Yankees". Latimesblogs.latimes.com. December 14, 2010. Retrieved September 15, 2011. ↑ "Russell Martin: I wanted to see if the Dodgers still believed in me". Latimesblogs.latimes.com. December 16, 2010. Retrieved September 15, 2011. ↑ "Report: Martin signs with Yankees | The Lohud Yankees Blog". Yankees.lhblogs.com. December 14, 2010. Retrieved September 15, 2011. ↑ "Source: New York Yankees sign catcher Russell Martin — ESPN New York". Sports.espn.go.com. December 15, 2010. Retrieved September 15, 2011. ↑ Rosenthal, Ken. "Pirates Agree To Terms With Russell Martin". Retrieved November 29, 2012. ↑ Cullen, Scott (November 30, 2012). "Numbers Game: Pirates ink free agent catcher Martin". TSN.ca. ↑ "Pirates officially sign Martin to two-year, $17M contract". TSN.ca. November 30, 2012. Retrieved November 30, 2012. ↑ "Pirates sign free agent catcher Russell Martin". November 30, 2012. ↑ "Martin up for challenge of catching knuckleball". Sportsnet. February 23, 2015. Retrieved February 23, 2015. ↑ Axisa, Mike (April 3, 2015). "LOOK: Montreal's Russell Martin gets standing ovation at Olympic Stadium". cbssports.com. Retrieved April 4, 2015. ↑ Leshinski, Ted (April 19, 2015). "Jeff Francis, Russell Martin become Blue Jays' first Canadian battery". fantasynews.cbssports.com. Retrieved April 19, 2015. ↑ Chisholm, Gregor (June 2, 2015). "Martin swipes home on double steal in DC". MLB.com. Retrieved June 3, 2015. ↑ Davidson, Neil (September 26, 2015). "Blue Jays outlast Rays in wild 10-8 victory". ctvnews.ca. Retrieved September 26, 2015. ↑ "Russell Martin Statistics and History". Baseball-Reference.com. Retrieved October 5, 2015. ↑ "Finalists for Gold Gloves unveiled". MLB.com. October 29, 2015. Retrieved October 29, 2015. ↑ Ken Gurnick (March 12, 2009). "Tobacco-free Martin rejoins Dodgers". Retrieved March 13, 2009. 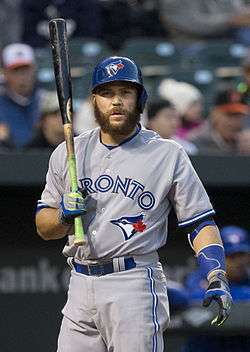 ↑ "2013 World Baseball Classic -- Russell Martin will play shortstop for Team Canada in WBC – ESPN". ESPN.com. Retrieved November 17, 2014. ↑ "World Baseball Classic: Bucs will have one less participant in Classic". World Baseball Classic. Retrieved November 17, 2014. ↑ Waldstein, David (June 16, 2012). "One Hard Way to Play Ball: Russell Martin Plays Catcher, the Toughest Position in Baseball". The New York Times. Retrieved September 9, 2012. ↑ Singh, David (April 3, 2015). "Russell Martin Sr. plays anthems at Blue Jays game". Sportsnet. Retrieved April 4, 2015. ↑ "The Official Site of The Los Angeles Dodgers: Team: Player Information". MLB.com. Retrieved September 15, 2007. ↑ Gurnick, Ken (January 29, 2009). "Martin changes name, attitude for '09". MLB.com. Retrieved February 10, 2009. 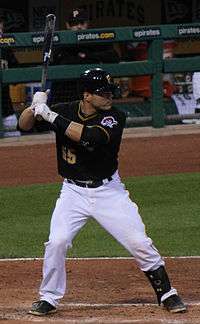 Wikimedia Commons has media related to Russell Martin.